Cairpad Size: 23" x 36"
CairPad disposable underpads for bed or chair protection are designed to cover mattresses in order to absorb leakages, reduce odors and maintain dryness. They consist of a polyethylene layer combined with sealed edges to ensure leakage protection. The highly absorbent material is evenly distributed throughout the core. Unlike other incontinence products that require washing and are very expensive, these sheet protectors are completely disposable and very cost effective. 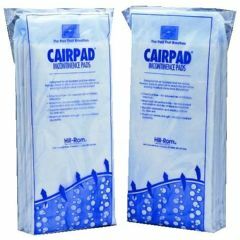 CairPad disposable underpads also offer the added benefit of a smooth side to help in patient transfer and repositioning! Each CairPad underpad features a quilted mat for enhanced fluid dispersion, helping to keep it from overflowing or seeping through. The interior liner of these disposable bed pads is soft to the touch, vented to keep cool, and non-irritating to the user’s skin. The outer barrier is soft and smooth, assisting you with repositioning and/or transferring your patients. By the makers of Attends Healthcare products.